The #23 on the turntable at McCloud. Note this high headlight, which is why the bell is positioned as high as it is. 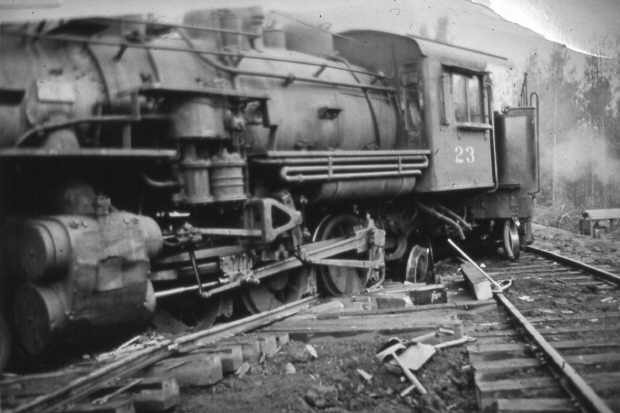 The headlight was originally mounted in the center of the smokebox on all four Alco prairies delivered to the railroad in 1925, but a problem was encountered with the headlights on the #22 and #23 being knocked off by the woods crews while coupling the locomotives to loaded log cars. 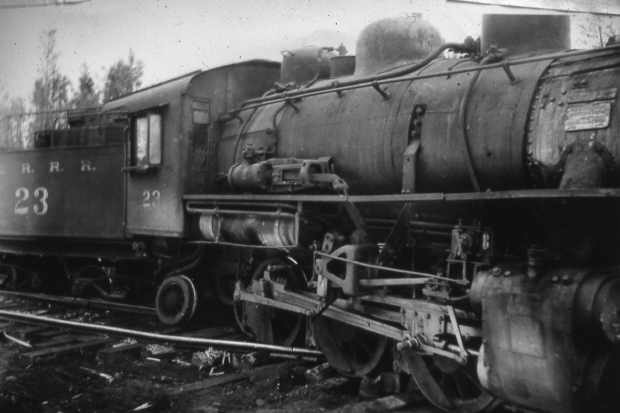 The shop tried moving the headlight on the #23 to the top of the smokebox, but a flimsy bracket was used, with the result that the headlight kept breaking off when mounted there too. In the end the shop re-mounted the headlight back to the center of the smokebox, using a much stronger bracket. This rare photo was taken during the brief time that the headlight was mounted on the top of the smokebox.Photo by Jimmy Boynton and is from the Dennis Sullivan collection. The #23 with another of the railroad’s 2-6-2’s taking water from the water tanks at Pondosa. Photo is from the George Landrock collection. 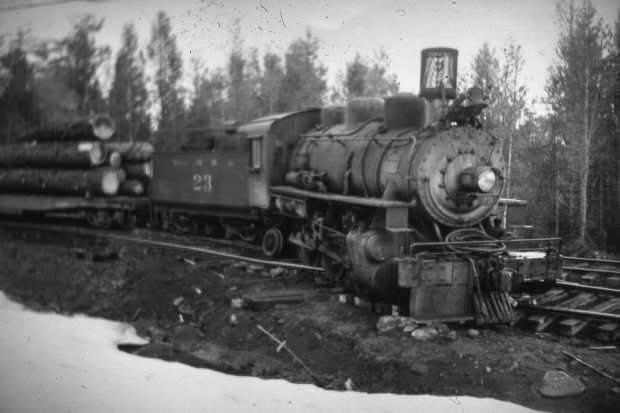 The #23 somewhere north of Pondosa.Photo is from the Dennis Sullivan collection. The following three photos were taken shortly after the #23 split a switch somewhere close to Pondosa. Photos are courtesy of Dennis Sullivan. This is a photo of the #11 in service as Arcata & Mad River #11. Photo is from the Glen Comstock collection.